Seven-time all-Ireland champion John Whelan is one of the world’s best living Irish button accordion players. John was raised in the vibrant London Irish music scene of the 1970s, and learned his craft from legends Lucy Farr, Roger Sherlock, Paddy Taylor, Mick O’Connor and his teacher Brendan Mulkaire. John moved to the USA in 1980 and has been inspiring Celtic musicians and fans ever since. Along with his All-Ireland Championships, he was twice awarded musician of the year from the Irish Music Association. He’s recorded over 15 CDs and isn’t stopping yet. Dynamic young fiddler Haley Richardson began making her mark in the Irish music world at six years old when she won the All Ireland qualifier in the under 12 category. Over the past ten years, she has amassed a long list of accomplishments and performed at venues all over the United States, Ireland, United Kingdom, and Thailand. 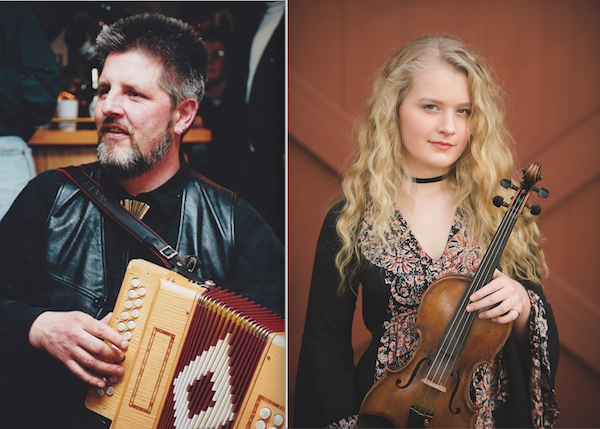 Haley, with her highly ornamented Sligo style perfected under the tutelage of fiddler Brian Conway, is the 2017 All Ireland U15 Fiddle slow air champion, 2015 Junior Fiddler of Dooney, and 2013 All Ireland U12 Champion in both fiddle and fiddle slow airs. Haley has performed with many of the most well-known names in Irish music including The Chieftains, Altan, Dervish, Mick Moloney, Pride of New York, Liz Carroll & Cherish the Ladies, Paddy Keenan, and is a regular member of Green Fields of America and The John Whelan Band. She has been the band fiddler in the Studio2Stage Irish dance production That’s Dancing” and was featured in an article in Fiddler Magazine’s Fall 2015 issue. Here’s a video of Haley and John (he looks different from his 1985 picture, above. She wasn’t born then). See the RESERVATIONS page to make reservations.